If you are planning your wedding in the DC area from out of town, you’ll want to play close attention today because Lindsay and Nate planned their wedding in Baltimore from far, far away in the Middle East! The pair were living overseas, but wanted to come home to Maryland (where they met and fell in love!) to wed. Through lots of time zones and late night phone calls, they selected a stunning wedding venue in downtown Baltimore, MD near there old stomping grounds to tie the knot – The 1840’s Plaza. 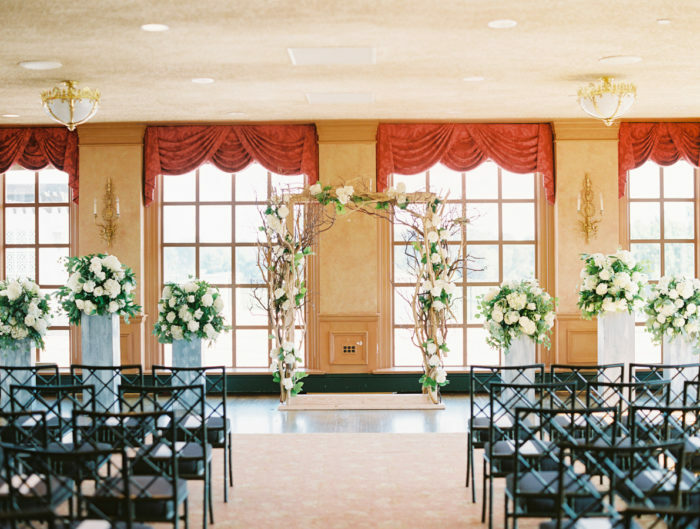 Their elegant venue and Lindsay’s gorgeous lace wedding dress (which we love!) set the tone for their vintage, old hollywood-inspired wedding full of elegant black and white wedding details. 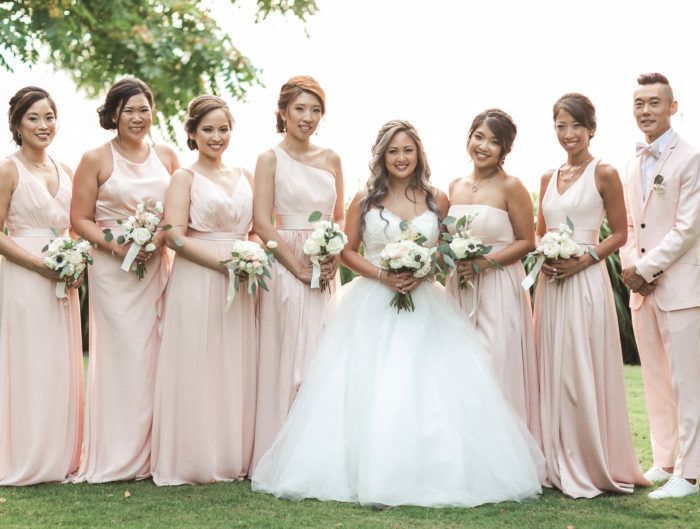 Because they were planning from so far away, their wedding turned out to be one big family affair, with everyone getting involved to help make it amazing. A friend of the couple made their wedding favors, a bridesmaid did bride’s makeup, and mom even addressed their wedding invitations! So, when it all came together on the big day, the wedding day details were that much more sweet for these newlyweds. We love it when loved ones come together, especially for a couple planning from afar, to make their wedding day personal and truly unforgettable. 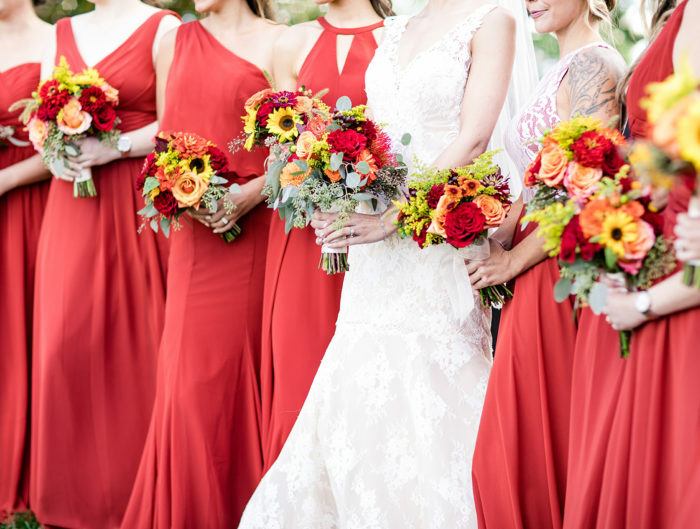 A special thanks to Hamilton Photography for sharing Lindsay and Nate’s elegant Baltimore wedding with us! From the bride: We were so happy to be able to come back to Baltimore for our wedding. It’s where we met and first started dating, and we got married a few blocks from our old neighborhood in downtown Baltimore. We considered a destination wedding, because we are so far away and our friends and family are scattered throughout the world, but in the end Baltimore was the only place that really made sense to us. We’re so grateful that everyone was willing to travel to Baltimore to celebrate our wedding with us, and it was the perfect setting to start this next phase of our lives together. We were inspired by vintage glamour and Old Hollywood for our wedding. The two things that set the tone for this were the venue and my dress. The 1840’s Plaza is a beautiful old building in downtown Baltimore, and one of the last iron facade buildings on the East Coast. It cuts such a dramatic figure and was a beautiful spot to take wedding photos. I knew I wanted a very simple sheath silhouette for my bridal dress so that I could have some more dramatic details like intricate beading and the bird cage veil. The main priority for our wedding was working with trusted wedding vendors! We planned our wedding from 7,500 miles and several time zones away as we are currently living in the Middle East, and the bulk of the wedding planning was done in two trips home to Baltimore over the course of about a year before the wedding. The wedding planning was also a lot of late-night phone calls and emailing back and forth. I chose wedding vendors that either came highly recommended through friends or are well-known in the local wedding industry for quality work. We didn’t have the luxury of tastings or getting too caught up in wedding details, so I wanted a caterer that I already knew was excellent. I had attended many events catered by Rogue during my time in Baltimore. We wanted a wedding florist who could take our basic ideas and run with them to produce a fantastic final product on our wedding day. We splurged on two things for our wedding: a large wedding party (we are lucky to have so many amazing friends!) and, last-minute, a photo booth through my photographer. Both were excellent splurges that we’re now grateful we decided to include in our wedding. We skipped on a wedding videographer and so far we don’t regret that choice at all. Although neither of our families are Jewish, we had some Jewish wedding guests who asked if we could do the Horah. The DJ asked us and we agreed, so some chairs were found and my husband and I were hoisted up in the air. It didn’t stop there – they then danced with the two mothers and then the two fathers. It was so much fun, and the pictures that we have are priceless! Our wedding planning situation was a little unique because we were planning from abroad and came into Baltimore about ten days before the wedding. In some ways, it was a relief to not get hung up on wedding details – does anyone really remember what color your napkins were? – and in others it was stressful and difficult to be so far away. My wedding planning advice to other couples is to find wedding vendors who are willing to work with you under whichever circumstances you find yourself in, and to trust them to do their jobs. They are professionals who do this hundreds – if not thousands – of times per year, and I had to learn to let go of details and just trust that everything would turn out Ok. And, everything did! In terms of the actual wedding, if there’s any way you can plan in even just 15 minutes to spend alone on your wedding day with your now-husband/wife, ask your wedding planner or coordinator to work that in. I don’t think I saw my husband at all except when we said “I do” and when we danced together! I do regret that we didn’t get a moment to stop and just be together, take a breath, and be present with each other. Congratulations to Lindsay and Nate! Thank you for sharing your elegant ballroom wedding with us! Thanks so much for featuring our work! It was a great pleasure to work with such a wonderful couple and so many excellent vendors!